A teaser poster for the Huawei Nova 4 has now surfaced online, confirming that the front side of the device will feature a "punch hole" front-facing in-screen camera. Samsung and Huawei both teased the announcement of almost all-screen phones with a circular cutout for the front-facing camera before the end of the year. Samsung too is suspected to release its phone during December and in all probability will directly compete with Huawei Nova 4. It now seems Samsung wants to get out in front by announcing the Galaxy A8s on December 10, a full week earlier than the Nova 4. Talking about the design, the smartphone will carry a true bezel display with no-notch whatsoever with an Infinity-O display. What's interesting about this launch is that the smartphone will bring a new solution to the notch. As usual, the Wi-Fi Alliance certificate for the Galaxy A8s doesn't reveal anything more apart from its Wi-Fi capabilities. Samsung has just confirmed the launch of their first "Infinity-O display" smartphone, the Galaxy A8, for December 10th in China. This would appear to be an expansion of in-display fingerprint technology that's expected to show up in next year's Galaxy S10 models, which would be its first phone with such a sensor. The handset is rumored to pack a 3,400mAh battery and it will have a USB Type-C port. The device was seen sporting a new display design with a hole at the top-left corner. Unfortunately, there's no information yet on the exact screen size of its LCD display. The upcoming Samsung Galaxy A8s smartphone has a date is official unveiling in China. Inside the chassis, the Galaxy A8s could boast either a Snapdragon 710 SoC or a Snapdragon 660 AIE processor. 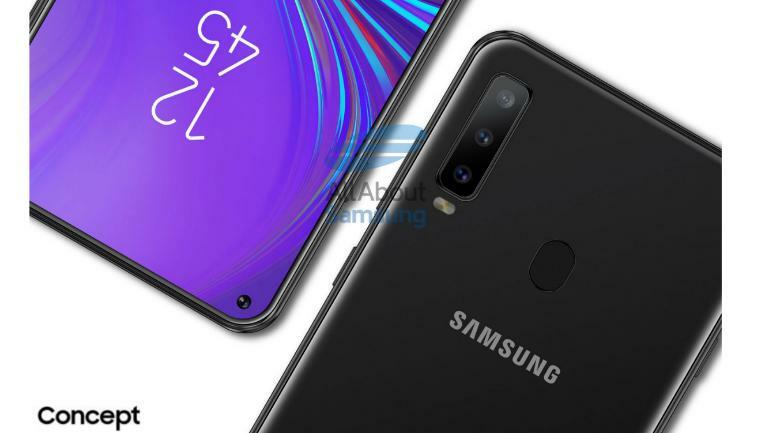 The upcoming Galaxy phone is also expected to feature a set of triple rear cameras that will be vertically aligned like the ones found on the Galaxy A7 (2018).